We’d love your help. Let us know what’s wrong with this preview of The Politics Of Anti-Semitism by Alexander Cockburn. How did a term, once used accurately to describe the most virulent evil, become a charge flung at the mildest critic of Israel, particularly concerning its atrocious treatment of Palestinians? Edited by Alexander Cockburn and Jeffrey St. Clair, the print and online journal CounterPunch has become a must read for hundreds of thousands a month who no longer believe anything t How did a term, once used accurately to describe the most virulent evil, become a charge flung at the mildest critic of Israel, particularly concerning its atrocious treatment of Palestinians? Edited by Alexander Cockburn and Jeffrey St. Clair, the print and online journal CounterPunch has become a must read for hundreds of thousands a month who no longer believe anything they read in the mainstream press beyond the sports scores. On the subject of Israel and Palestine, the Israeli lobby in the U.S., the current Middle East crisis, and its ramifications at home and abroad, CounterPunch has been unrivaled. Herein, you’ll find CounterPunch’s most compelling reporting and commentary on this topic. Contributors include: former U.S. Representative -Cynthia McKinney, famed British foreign correspon-dent Robert Fisk, former seniorCIA analysts Bill and Kathy Christison, the trenchant and witty philosopher Michael Neumann, seasoned Capitol Hill staffer "George Sutherland," Norman Finkelstein, the leading Israeli dissident Yuri Avneri, Shaheed Alam (who became a target of the fanatical Daniel Pipes), and Israeli journalists Neve Gordon and Yigal Bronner. In addition are: Will Yeoman's path-breaking essay on Israel and divestment, >Kurt Nimmo on the hysterical attacks on AmiriBaraka for his poem on 9-11, Anne Pettifer’s Zionism Unbound, Jeffrey St. Clair on the (Israeli) attack on the USS Liberty and the suppression of the investigation, and >Alexander Cockburn’s caustic and lightheartedmemoir of his own experiences of being attacked as an anti-Semite, consequent upon his criticisms of Israel. This first book in the new CounterPunch series, is a timely anthology on the compulsion of silence and complicity in crimes against a betrayed people. To ask other readers questions about The Politics Of Anti-Semitism, please sign up. I've lost count of the amount of times I've been accused of being an anti-Semite when debating the Palestinian-Israeli conflict. It is the standard issue response so called "supporters" of Israel, no matter what, use against arguments and facts that are for them disturbing. There is some variety in how the abuse is delivered, ranging from it "pains me to say but my gut feeling is you are anti-Semitic" to the more frothy mouthed Zionists who accuse you of desiring a second holocaust, and wishing to drive every Israeli Jew into the Med without so much as a pair of water wings between them. The purpose is always the same: to head off legitimate criticism. The charge of "anti-Semitism" relies on falsely conflating being Jewish with being Zionist in order to link the actions of Israel with a whole race and religion. Once that fallacious premise is accepted the illogical becomes "logical" (ie. legitimate criticism of the Israeli state becomes illegitimate criticism of Jewish people everywhere). That this tactic in actual fact devalues the horrors of centuries of real anti-Semitism including the monstrous, murderous barbarities of Nazi holocaust is of no concern, as long as the "supporters" of Israel can intimidate, marginalize, smear and defame those who are speaking in a rational and moral manner about the brutal realities of Israeli policies in annexed Golan and East Jerusalem, the occupied West Bank, and blockaded Gaza. There is something morally repugnant about this abuse of past suffering of Jews in order to dismiss those who speak up about the current suffering of Palestinians. 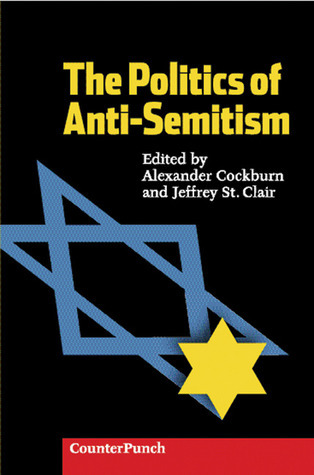 Alexander Cockburn and Jeffrey St. Clair of CounterPunch are the editors of "The Politics of Anti-Semitism": a collection of essays and short pieces that deal with this phenomenon from a variety of points of view. Aptly enough the editors, with long years of service with CounterPunch, contribute a couple of pugnacious pieces; Cockburn dealing with his experience in the U.S. entitled "My Life as an `Anti-Semite'" and St. Clair, in one of number of the pieces that stray from the main topic, with an account of the Israeli attack on the USS Liberty in the early stages of the June 1967 war (people within the Navy who tried to get to the truth of the Israeli attack were labelled anti-Semites, as was the library built as a memorial to the 34 dead sailors). Other highlights include Edward Said's concluding essay, a robust and principled re-stating of the Palestinian question; Economics professor M.Shalid Alim's account of his experiences writing and speaking critically of Israel in the US; the journalist and former Knesset member Uri Avnery's piece "Manufacturing Anti-Semites"; and not just for its title Robert Fisk's "Why Does John Malkovich Want To Kill Me?". On the down side Kurt Nimmo's "Poetry as Treason?" with it's defence of Amiri Baraka pernicious and pathetic poem on 9/11 is a waste of space; and Jeffrey Blankfort's "The Israeli Lobby and the Left" makes some valid points, not least in his criticism of Noam Chomsky's view of the lobbies influence as being marginal, but he does labour the point somewhat. It has some nice articles about the Jewish lobby, the attack on the USS liberty and about the occupation of Palestine. Nothing special just kicking in open doors. For the rest: the leftwing jews do not agree with the orthodox jews about what is the best strategy for calling naughty gentiles "anti-semites"
The leftwingers consider "calling someone an antisemite" something valuable that becomes less valuable ever time it`s used. It has some nice articles about the Jewish lobby, the attack on the USS liberty and about the occupation of Palestine. Nothing special just kicking in open doors.